If you’re anything like me, then you know that nothing makes my day better than getting out on the water. Unfortunately, those months of water skiing and snorkeling are temporarily behind us, but that does not mean the fun on the water has to stop! Cold-water fishing is a fun and challenging activity to do on your boat in these coming cold months. While I am not an angler myself, I will certainly eat what you catch and enjoy the boat ride along the way! In Florida, we tend to do most of our fishing in the warmer months because the fish are more active with higher metabolisms, but fishing in the winter can bring a new challenge to your fishing game and it is always fun to have to try new tactics in a familiar area. Below are some tips and tricks to maximize your chance of success out there! Search in deep holes and shallow flats. Water temperature is key when doing cold water fishing. Fish seek out warm pockets of water which are located in the deep holes and shallow flats, use a depth finder to find the deep holes in the river. Be sure to look for areas where creeks and rivers feed a larger body of water. Often these creeks/rivers are warmer than the larger body of water and fish will congregate in the outflow. Slow down your presentation. The cool water causes fish to move and react slower, by slowing down your lure or bait jerks and movements. Because of this their metabolisms are slowed down they will only go after prey that require minimal effort. A slowly moved lure/bait will stay in their strike zone longer, increasing your chances of catching the fish. Start later in the day. While generally in Florida it is best to start fishing as soon as the sun is coming up, but during the winter it is important to go when the water is the warmest. Starting mid-day is best for your fishing trips. Increase the scent of your bait. Because their metabolisms are slowed due to the cold, they will need more incentive to take your bait/lure. Try clipping the tail of your live bait to chum the water a little or soak your lure in more scent before casting it into the water. Monitor the cold fronts. Florida’s winter always brings a myriad of cold fronts which barge the state with rain and wind. The best time to go fishing is the couple days after the initial stormy, windy weather before the next cold front comes along. 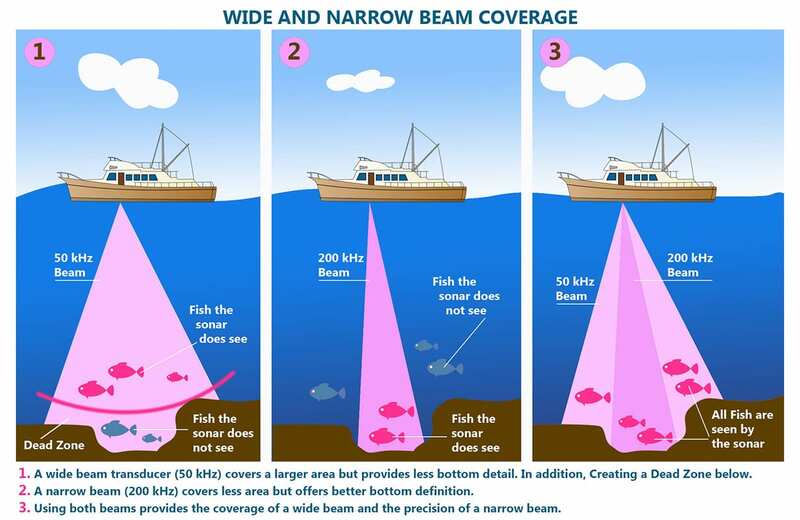 Below is an infographic demonstrating how to correctly focus your depth finder to pinpoint the deep hole spots.